Did a search and glad to see that we've got some threads on Hobos. What do Hobos do when they retire? 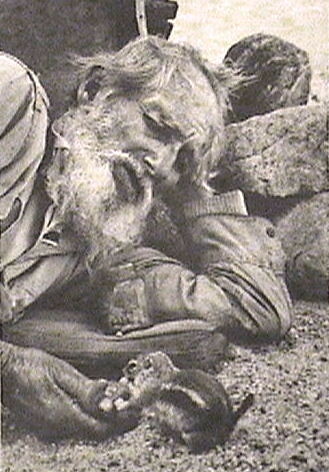 One One Hobo of interest was Hubcap Willie McDavid, who retired to live as a desert hermit outside of Palm Springs California. 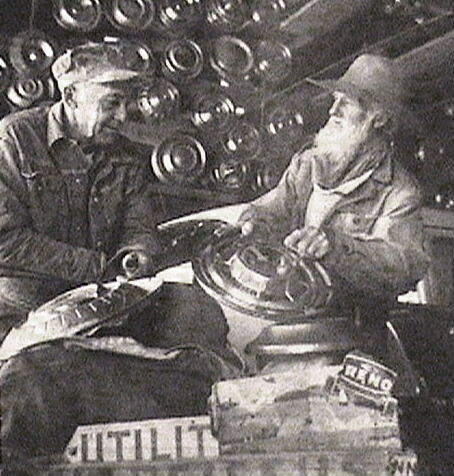 Hubcap Willie was the subject of an early 1962 photo essay in Life Magazine. "Serenity on $400 a Year"
Furious at paying out hard-earned money in taxes? Feeling trapped on a treadmill, scrambling for money to buy more posessions? Fed up with the frantic struggle to make enough to have a good time? Have a look at a roadside Thoreau named Willie ("Hubcap") McDavid, age 67, one of the relatively few Americans who have genuinely retired from the money race. Willie does very nicely on less than $400 a year, living in a 4x8-foot desert shack six miles from Palm Springs, Calif., paying no rent, no taxes, no heat bill. He is a highway comber supporting a peceful life of solitude by gathering the flotsam and jetsam of the high-speed world he has rejected. Each week, pushing a cart, he hikes three days along 40 miles of highway to Banning, Calif., gleaning the myriad items that blow from the cars whooshing by at 65 mph. In Banning he sells his finds: hubcaps, bumper guards, pop bottles, shirts, hats, blankets, even wrist watches--lost as people throw cigarets out of windows. 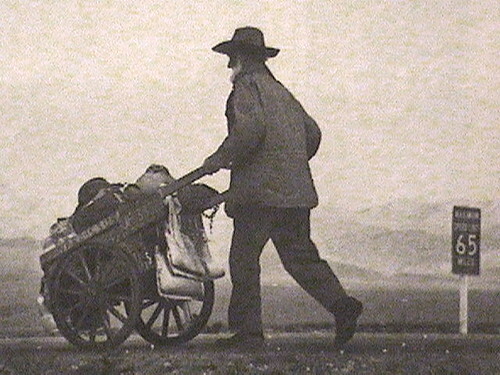 Willie, who did a World War 1 hitch in the Marines, was a hobo for much of his life--he has literally walked coast to coast three times. "As a kid in Mississippi," he says, "I used to see the boxcars come in and I thought, 'Someday I'm going to see where the trains go.' I done it. When you get in the habit of moving, there's always some place else you want to see." Fourteen years ago in California, feeling he had now seen everything, he found a way of settling down while still remaining a free spirit. At his shack, built from a roof that blew away, Hubcap McDavid does his washday chores. After his weekly trip to Banning he scrubs all his clothes and himself, no matter what the weather. "I've had icicles in my beard," he says. The license plates and emblems on the shack not only decorate but cover cracks. 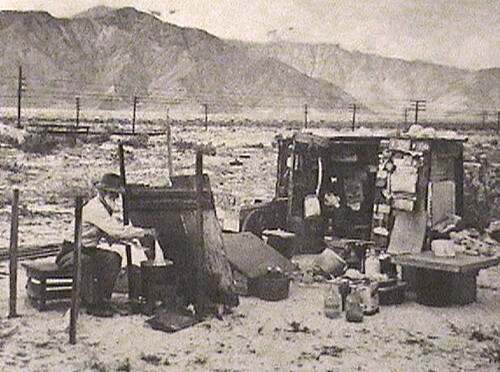 In Banning, Willie sells hubcaps to garageman William Jameson, who pays 25c to $1.50. Before turning pop bottles in to store, Wilie fastidiously washes them. In the summer he collects several cases of bottles. Once he found a windfall of $65 in paper money blowing across the desert. In Banning, Hubcap lays in $2.59 in supplies, including the luxury of a 10c pie and a 15c bag of nuts for companionable ground squirrels. 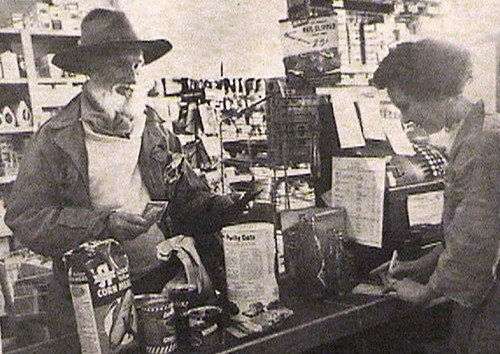 His food averages $5 a week plus an occcasional $1.49 on a half gallon of wine. Hubcap's love of animals has made him a vegetarian for the past seven years. "I see lambs coming by on the train," he says, "bleatin' so sad on their way to market. It's a dirty trick eatin' up the other fellow." It is just as well that he is a vegetarian because he is now down to five teeth, having pulled out the rest himself with a pair of pliers as each went bad. Otherwise, he never knows a sick day. An interesting read. I'm always fascinated by those who drop out of the rat race and do it their own way. Thanks for the post, Mr. Pick. I would hope that we could learn more about Hubcap Willie, such as how long he lived after that Life magazine story, and whether he had any surviving family. I would think it might be better to look on websites devoted to Hobos, rathern than Hermits. 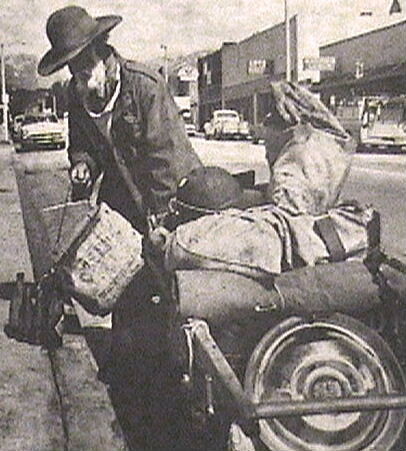 I have done some net searches, and there are quite a few web sites as well as hard copy books, about hobos, and I hope that Hubcap Willie would be remembered by the Hobo Community with a listing. At home Willie boils his laundry over the open fire on which he cooks his frugal meals. He screens it from the persistent wind with fence of boards. Because of the wind he has to anchor under heavy rocks his shack roof and the cans of water which fill his desert yard. He loves his home site. "There's nothing like these mountains anywhere," Willie says, "and there's the purest breathing air here." Willie trundles briskly along U.S. 99, keeping a sharp eye for salable trash. "I've good feet and endurance like an old flivver," he says. On his trips all his posessions are in his cart to prevent loss to tramps breaking into shack. "Munks are just like people"
Willie is well liked locally ("He's good people," says a nearby gas station owner), but his real friends are the ground squirrels who share his plot of desert. He calls them chipmunks and has fed them from babyhood on free sacks of grain confiscated from overloaded trucks at a highway inspection station. Once a week there is the treat of nuts (below), and his cornbread recipe makes enough for one adult and 12 squirrels. Around his shack he has scattered 130 rubber tires with holes cut in the sidewalls so the squirrels can escape into them from dogs or their mortal enemies hawks. "Munks are good company," says Willie. "They're just like people. Some are friendly and they'll crawl all over you. Some are mean. Some people, no matter how long you know them, keep their distance. Same with munks." I'm curious...who exactly is "TheOldMan"? Jim, thanks for the post. If you are referring to my avatar, I'll tel you who that Old Man is: Veteran character Stewart Lancaster. I think he is a good personification of an "Old Man." I have, thru the years, wondered Whatever Happened To Hubcap Willie? How long did he live after the Life Magazine article. 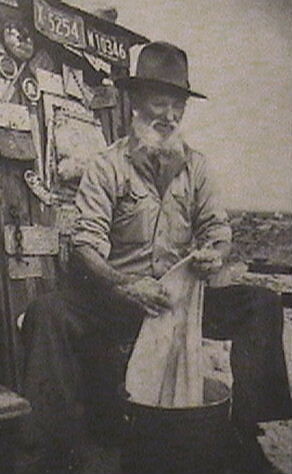 "John Fogherty, Green River Up at Cody's Camp I spent my days . . . With flatcar riders, and crosstie walkers . . . "
Glad you like the signature. A lot of the fogharty songs have lyrics that would make good signatures for a railroad posting board.